Courtesy of Sakhalin Energy Investment Co., Ltd. In recent years, stricter environmental regulations and higher HSE (Health, Safety, and Environment) requirements, the demand for energy integration and efficiency improvement are becoming more and more complicated and diverse. 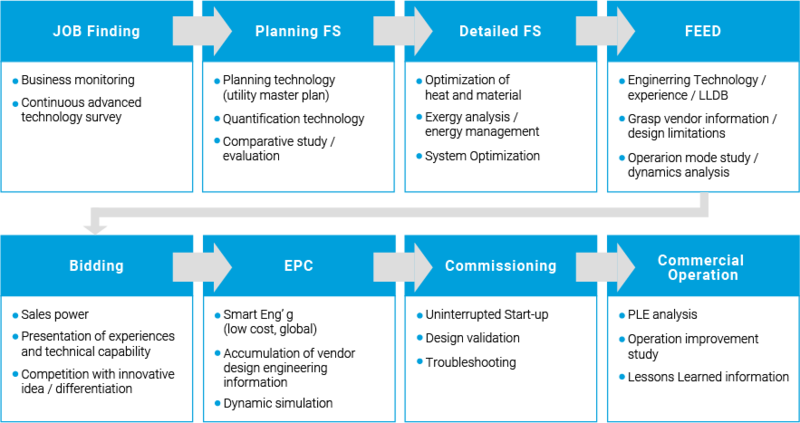 In order to meet these complicated and diverse demands, Chiyoda offers an optimal Utility & Offsite system (integrated utility system) by following scheme. Utilization of unused heat / power sources through heat recovery from gas turbines flue gas , cogeneration, low-grade heat recovery, etc. Utilization of various membrane technologies such as MBR, MF, RO, EDI, etc. in fresh water/wastewater treatment and air separation, etc. for the reuse / recycling of water to achieve “Zero Liquid Discharge” with combinations of evaporation and membrane technologies. LNG plants, refineries, petrochemical plants, new processes such as GTL (Gas to Liquid), coal gasification, heavy oil cracking, etc., and in the new business fields of water, power, environment, and clean energy, etc.